And the drama that ensued on the internet and all the stuff I had to do to legally protect and educate myself just sucked up all my time and energy and money. It has been exhausting and it’s not all over yet. The silver lining: I learned that I have a very large group of supporters whom I am very grateful to; I learned that I need to be much more proactive about getting my artwork out there in the physical world, beyond just posting stuff up on the internet… I need to market myself a lot better. Deep breath. 1. 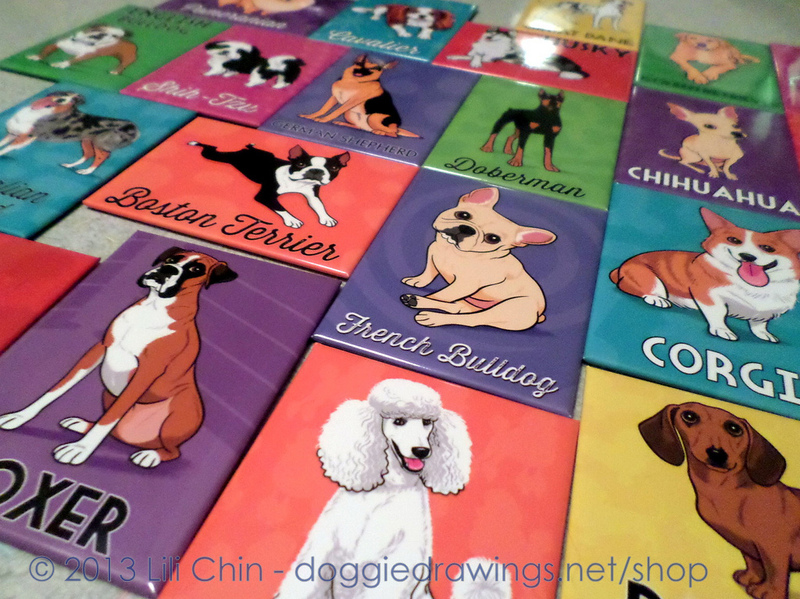 My new series of Dog Breed magnets and buttons! 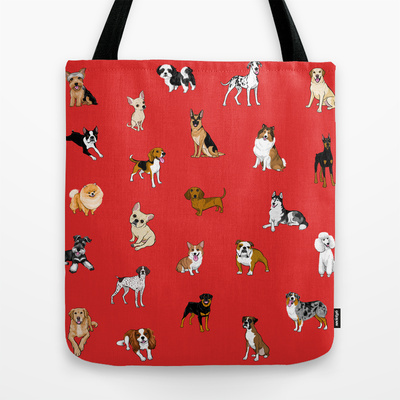 There are 24 dog breeds in this series and I am selling a few of these in my etsy store. If you are interested in wholesale orders, or know anyone who might be interested in wholesale orders, please click here for the pricing and ordering information. I want these on pyjamas!!! 3. The World’s Most Dangerous Foods for Dogs – this is now available as a 4″ x 6″ fridge magnet, and I will have more available soon also at my etsy store. 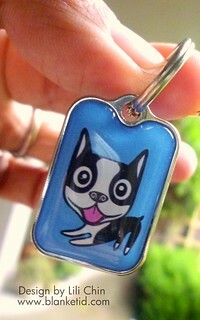 (including a version with blank spaces to write your own emergency/vet phone numbers) The Design Lab Creative Studio webstore is also selling these. 4. 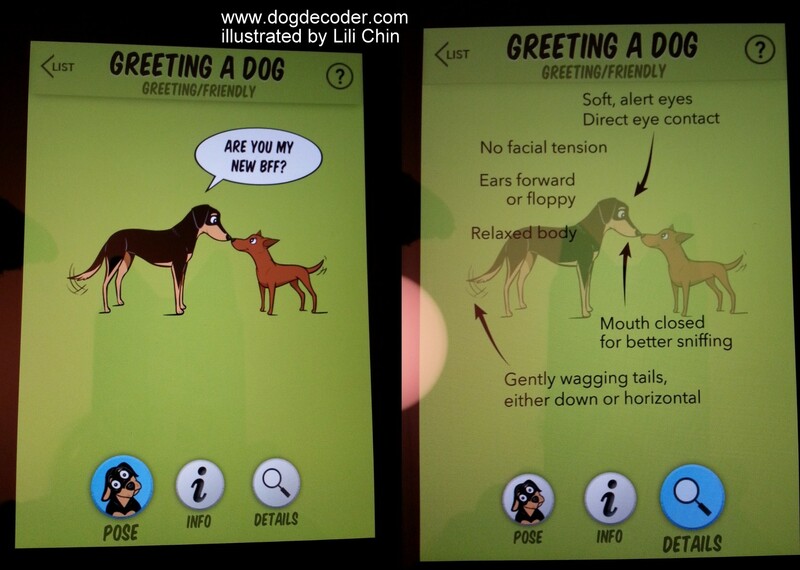 Dog Decoder is a new iphone app that I did the illustrations for. 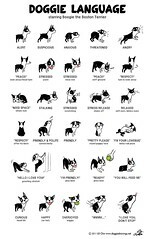 This is a really cool and slick app on dog body language which includes a quiz to test your dog-reading skills. There is more information and screenshots HERE, and you can purchase the app at the itunes App Store for $3.99. (Every download helps the artist too, thank you :)) Unfortunately I don’t have an iPhone so I am eagerly awaiting the android version which is in the works. Next weekend I am going to my first ever Dog Obedience and Rally event as an observer… This will be a totally new experience and I am kinda excited and also nervous (will the majority of dogs be happy or under pressure?) I will take photos if this is permitted. 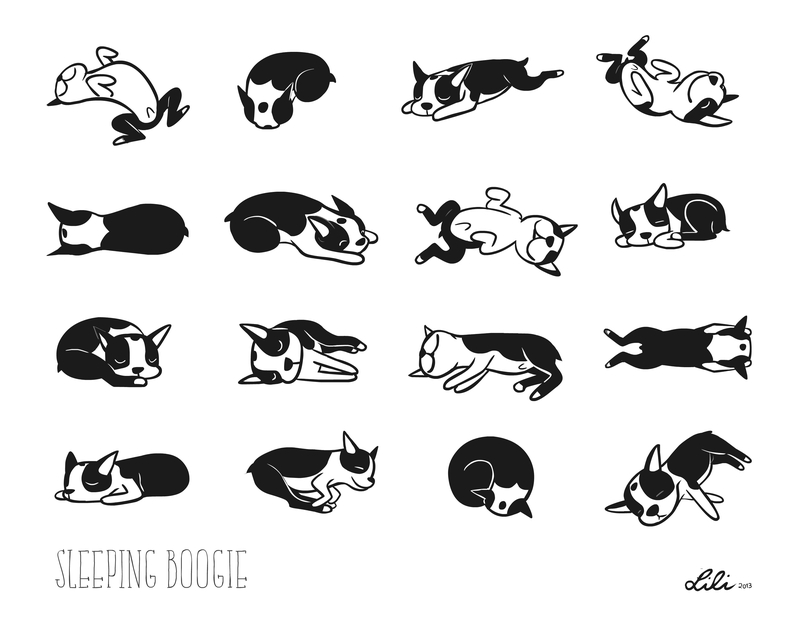 Apologies for the long silences between posts and thank you to everyone who has left comments (advice, tips, personal stories etc) on this blog, particularly with regards to Boogie’s skin issues. 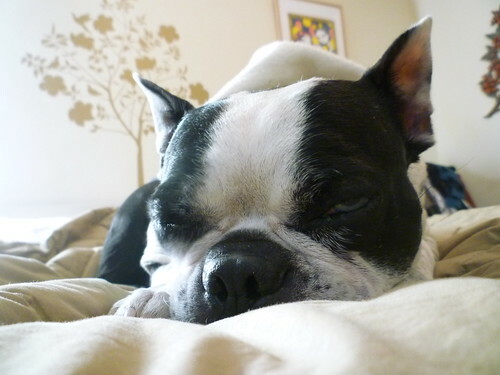 I have been out-of-town; now I am happy to be back home and snuggling with the Boogs again. He is less itchy now that the weather has cooled down. His coat is still very thin with the same bald patches, and his poor skin has been dry, flaky, and dandruffy. No chicken in his diet at all. He has been eating lamb and/or fish-based meals. It has only been 1 week… I can’t tell if there is any difference. Adding Pet Kelp to his food. 3 weeks, now. Can’t tell if this is making any difference with his skin, but his poop is looking very good! Virgin Coconut Oil massage, every other day <– THIS is making a difference! Skin is noticeably less dry. I am determined to do anything to avoid more vet visits & antibiotics! In fact, I took advantage of Monica Segal‘s recent Black Friday Sale and ordered a dietary consultation for Boogie in the new year. I need help figuring out what foods (if any) that Boogie’s system may not be tolerant of. 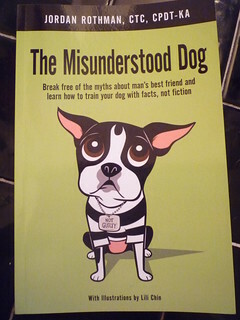 Check out Jordan Rothman’s new book The Misunderstood Dog, with my illustrations. 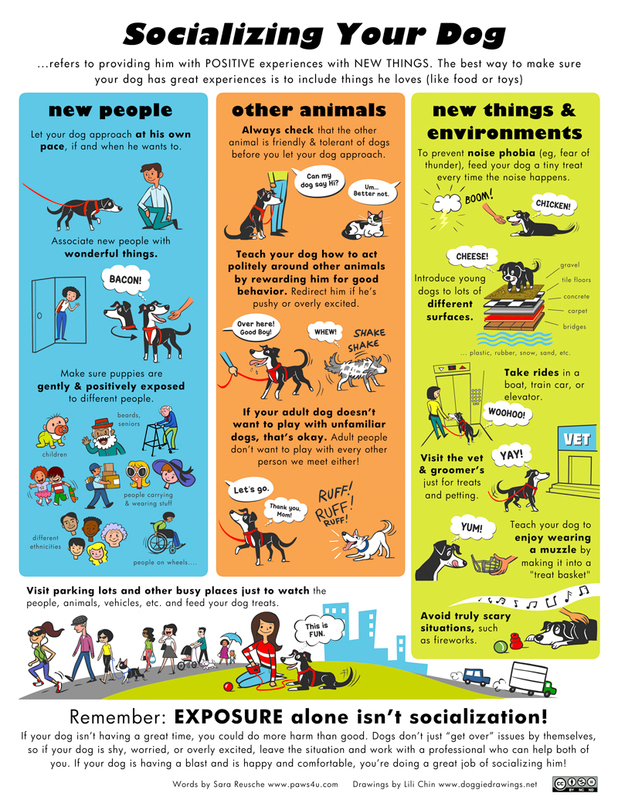 I would describe it as a simpler, easier-to-read version of “The Culture Clash”, written for dog owners. 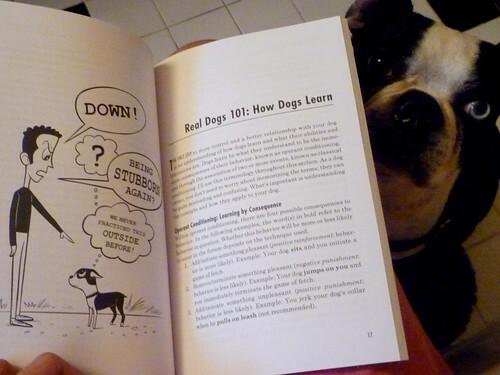 The Boston on the cover is the author’s dog. Here is the Amazon.com page. Who is going to Clicker Expo in San Francisco next month? I would love to meet up! I know names but not faces, so if you recognize me, please say hi! I will be there for the full three days. First time that I am staying for the whole expo and very excited! Catching up. Notes about Behavior/Training. It has been a crazy month – major computer issues, health issues, catching up on a huge backlog of work – and poor Boogie’s Blog has been neglected. I don’t have time to go into too many details, so this blog post is a quick summary of stuff that I have found interesting. ABA is concerned with using environmental events to change behavior in desirable ways. Much of the time, a behavior problem means either that a behavior occurs too often or that it does not occur often enough. The task of the parent, teacher, manager or therapist is to increase or decrease the frequency of the behavior.The chief difference between the people who live inside mental hospitals and those who live outside of them is not that we never behave as they do but that we behave as they do less often than they do. One of the great things about ABA is that is focuses on what people can do rather than on a label or on some mysterious, unseen psychological disorder. Please note that reinforcement strengthens BEHAVIOR, not PEOPLE. Everyone slips up now and then and speaks of reinforcing a person, as in, “John was studying very hard so I reinforced him”. You don’t increase the strength of people with reinforcement; you increase the strength of their behavior. Some people think that people with Ph.D’s go around thinking up new terms for everyday words just so what they say will sound more sophisticated. There may be some truth to that, but the word reinforcer is not just a synonym for reward. Here’s the essential difference: Rewards are defined by consensus; reinforcers are defined by results. If an event strengthens or maintains the behavior it follows, it’s a reinforcer; if it doesn’t it isn’t a reinforcer. There is no other defining characteristic of a reinforcer. This is an important point; one students often miss. People often get the impression that a behaviorist is someone who carries a bag of reinforcers about and whenever behavior needs strengthening, he reaches into the bag and hands out reinforcers. The essence of behavior analysis is not handing out reinforcers but analyzing the effects of antecedents and consequences on behavior. That includes identifying consequences that are reinforcing. My experience has taught me that we tend to presume a false correlation between reliable behavior & the use of aversives. 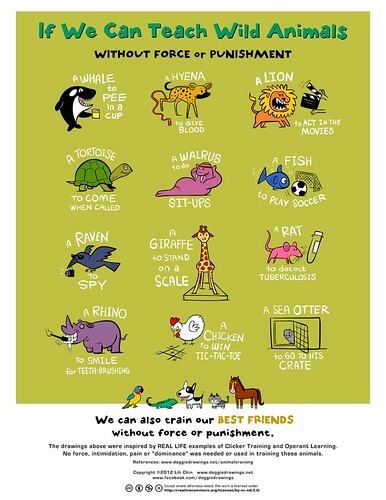 IOW, it seems to make intuitive sense that if the animal “must” do something really important (e.g., locate a bomb, track down a criminal, guide a blind person), we have to use some sort of force to teach the animal he doesn’t have a choice. Yet, I believe we revert to coercion and force when our skills at implementing structured, clever, careful reinforcement procedures run out. The dolphins I trained for the US Navy reliably located deep-moored mines (as much as 600 feet down), reported the mine’s presence to their trainer on a small boat, then carried a heavy packet of explosives back down to the mine, attached this in a quite specific location on the mooring cable, then swam back to the small boat and leapt onboard for the long ride back to their pier-side pens. This behavior chain was long, cognitively and physically challenging, performed in the presence of huge distractions (including live food-fish swimming all around the work site), and ended with each dolphin choosing to go back to captivity. 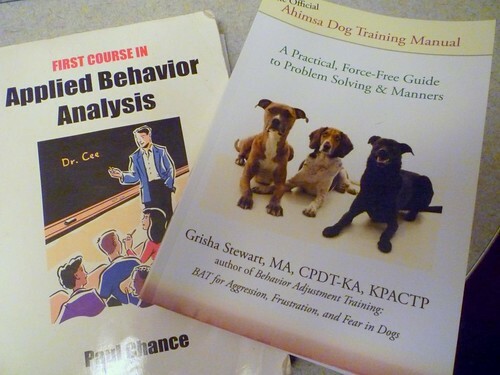 It is beyond the scope of this discussion of my book (Plenty in Life is Free) to further discuss details of this training, except for the critical fact that we did not use “corrections.” We obtained accurate reliable real-world performance through the use of careful design of the training environments and tons of R+ over the course of many months of training. Punishment was not part of the program. My affiliation (as an occasional consultant) with Guide Dogs for the Blind (GDB) over the past few years has allowed me to see how amazingly effective positive-reinforcement training can be when done by skilled and creative trainers. Their implementation of clicker-training over the past ~five years has been amazing to watch. Their results have been so impressive that guide-dog organizations all over the world are seeking GDB’s advice on how to modify their own programs. A gift from Pawalla; Boogie art! Two days ago, a giant box arrived from a new Los Angeles company called Pawalla. 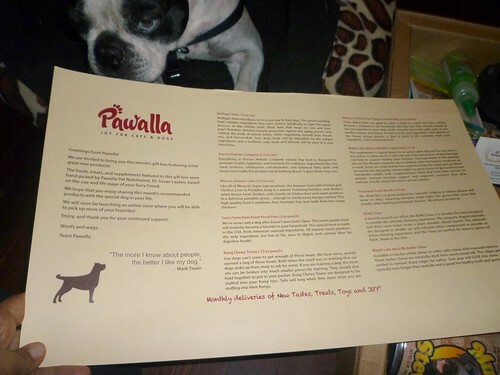 Boogie was very lucky to be selected to review a sample Pawalla monthly box. Just look at this! Wow. 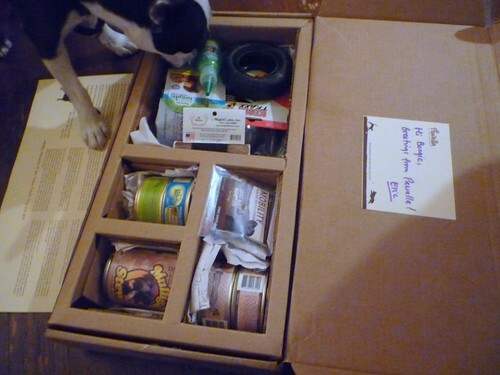 …our pet nutritionist constantly reviews foods from different brands, and selects her favorite all-natural products to put in our monthly box. The products selected are also customized based on both the size and life stage of the pet (we offer a monthly box for both cats & dogs). 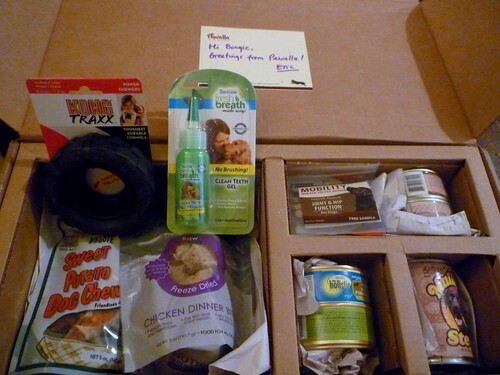 So the idea is to help discover and try new products that have been vetted and recommended by a nutritionist. If you do find something you especially like, we will also offer it for sale at a competitive price from our online store. Not only this, the box comes with toys! The first thing I gave to Boogie was the Wapati Labs Elk Antler Chew. Boogie had never seen or smelt an antler chew before so this was a new and exciting thing. He loves it. And then he played with the KONG Traxx tire toy, got a piece of Sam’s Yam Sweet Potato Chew (remnants of which are now all over my rug) and some KONG chewy treats on our walk. Yesterday morning I opened up a can of Weruva Amazon Liver: Chicken & Chicken Liver in Pumpkin Soup to add a spoonful to Boogie’s usual breakfast and Boogie stood by the kitchen door, eyes wide open, perked up and waiting. He knew he was getting something different today. He loved that too! This morning he sampled some Nutrisca Freeze Dried Chicken with his usual breakfast, and tomorrow maybe some Mulligan’s Beef Stew. I know there’s a rule about not switching dog food too dramatically to prevent upset tummies, so I am adding only tiny portions of the new food to Boogie’s regular THK and S&C food. 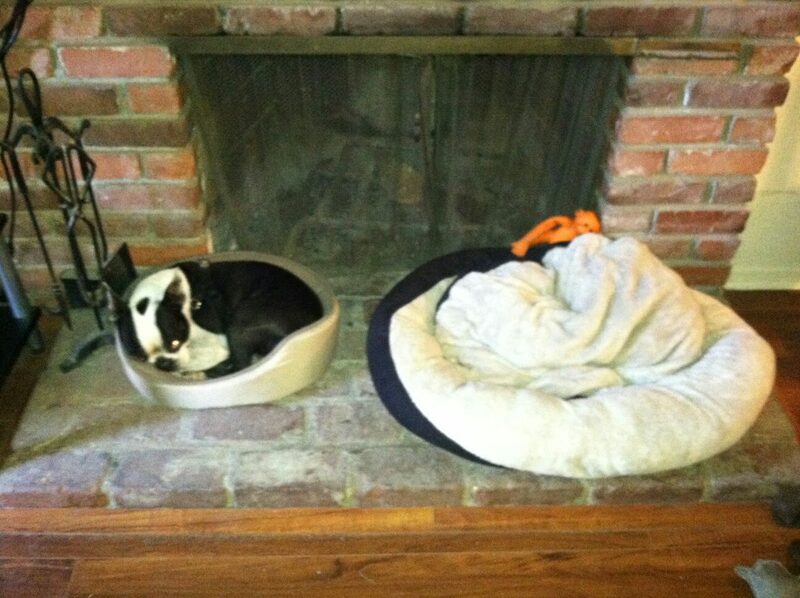 We have a slight problem with stinky poots, but poops are fine. The Pawalla Box seems to be an excellent way to try out new non-mainstream brands of dog food (and other goodies) that you might otherwise not know about, and I am happy to see that the selected foods are mostly holistic, grain-free and made in the USA. There is a list here of what comes in the monthly box. $26 for all this seems very reasonable! I think these boxes would make great gifts too. It has been while since I’ve blogged about food. Over the past 2-3 years, I have been partial to the ‘Varietal Feeding’ approach so Boogie has been eating homecooked meals, Stella & Chewy’s patties, Delifresh’s Vital, and The Honest Kitchen. Not only is varietal feeding important from the standpoint of preventing boredom, it also helps to ensure that Fido will receive a broader spectrum of nutrition, including enzymes, amino acids and antioxidants, compared with when he eats one single processed food every day. Many pet food manufacturers caution pet owners not to add anything to their products, claiming that doing so will throw off the balance of nutrients. 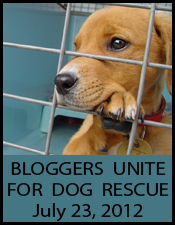 But a modern, domestic canine’s digestive system is not so primitive that it cannot handle a varied diet. As variety is introduced to the diet, so the body becomes more robust, and even more able to derive benefit from new, fresh ingredients. Three new foods to blog about this week! How cool is it that THK now uses resealable bags! One thing I like about THK’s foods is their versatility. You can serve THK with other ingredients like cooked meats and veggies, use as a topping, or incorporate into baked doggie treats. 2. The Honest Kitchen’s QUIET TEA . Quiet Tea™ is designed for dogs and cats, to help promote calmness and alleviate anxiety, tension and excitability during stressful or over-stimulating situations caused by factors such as separation, thunderstorms, travel, or events. I am still doubtful that Boogie would drink this tea because he doesn’t drink much of anything at all. Not even water. Example: yesterday I offered Boogie some kefir. He took a few licks and walked away. 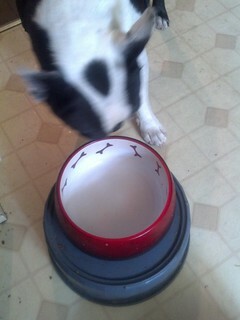 When I added a dollop of yogurt (which is essentially the same thing but in non-liquid form), he licked the bowl clean. 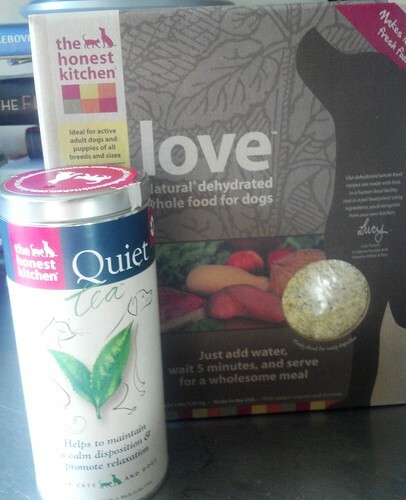 When I hydrated his food with this Quiet Tea, I was very surprised that Boogie did not stop eating and stare at me as he sometimes does “You expect me to eat this?” The tea has a very strong herbal smell … not a smell I imagine that dogs would enjoy, but what would I know. 3. 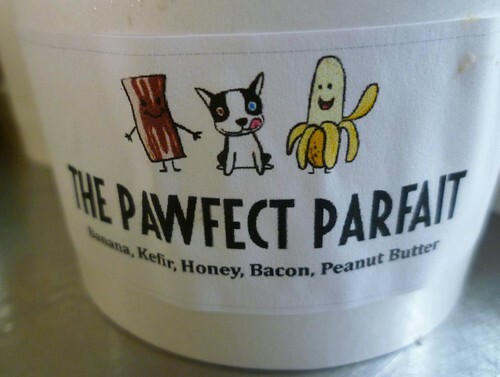 Homemade doggie ice cream: The Pawfect Parfait. Click here for the recipe. 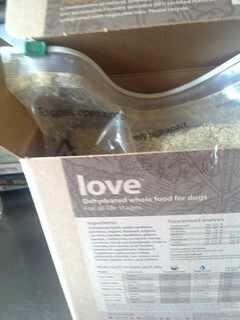 The ingredients are all safe for dogs and I consulted The Honest Kitchen recipe book to make sure. The ice cream base is banana blended with raw honey and low-fat kefir. Boogie doesn’t eat banana (like I said, he is a picky eater… doesn’t like any fruit except watermelon) but when it’s all mushed up with yogurt I guess it’s no longer banana. Mixed in are sweet crispy bacon pieces and swirls of unsalted peanut butter. 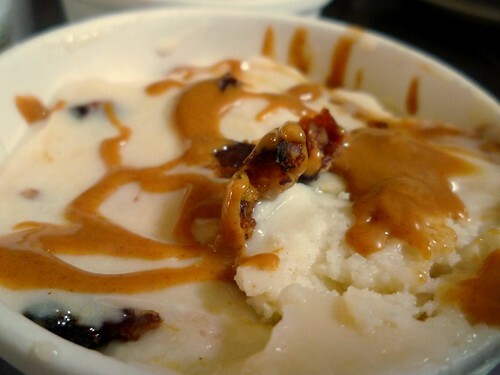 I almost added the rendered bacon fat to the ice cream for extra bacon-y aroma, but decided against this… Don’t want my dog to get pancreatitis or get fat! Empty clean bowl. I will take this as a sign that Boogie liked the ice cream! Yay. 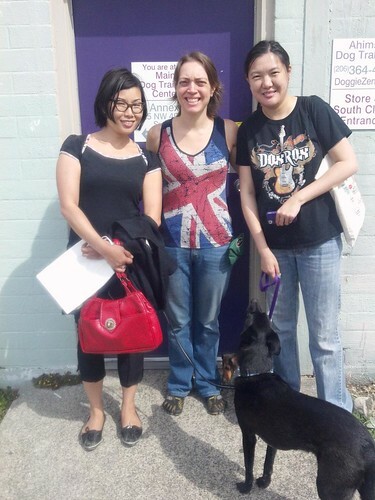 UPDATE: We just had a visit from our neighbors – Oliver, Piccolo and Benji. Four dogs at an ice cream party! Boogie is now over-the-limit for today.